MACHOSTER Review 2019: Is MACHOSTER a Good Hosting? MACHOSTER has been providing dedicated and virtual servers to customers in the EU for the last 13 years. They operate Tier IV data centers with over 700 server racks in Poland and the Netherlands. Some of the network providers include AMS-IX - Europe, Cogent, Tinet, Comcast USA, Level 3, and UA-X Ukraine among others. MACHOSTER is an EU hosting company that provides reliable and powerful dedicated servers in addition to VPS. With over 700 servers in Poland and the Netherlands, they can cater to your unlimited traffic and resource needs. 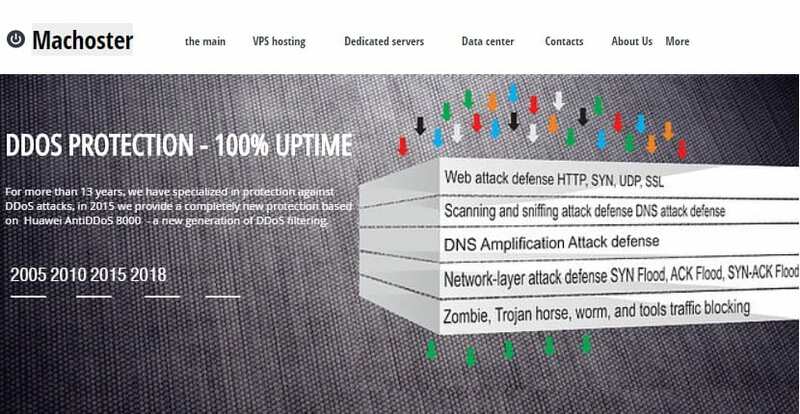 Customers enjoy 24/7 technical support and full DDoS protection. I know that server management can be intimidating anyone who’s unaccustomed to VPS or dedicated servers. To simplify things, MACHOSTER gives you access to the ISP Manager 5 – a free and user-friendly server control panel that comes with a set of tools for managing your web server. From the admin panel, you can create and assign rights and privileges to users, upload your websites, register domains, set up personalized email addresses, and much more via TeamViewer, IP KVM, and RDP. MACHOSTER spares no effort to keep your machines secure all year round. In 2015, they deployed a new DDoS filtering and protection system based on Huawei AntiDDoS 8000. With a firewall throughput of 480 Gbs and full filtering of parasitic traffic, it provides DDoS protection at various levels. You’re assured full network-layer defense, scanning and sniffing attack defense, and DNS attack defense. Their system uses a smart algorithm to detect attacks at network level before it triggers SYN flood protection and IP address change to counter brute force attacks. MACHOSTER charges a premium price for their VPS and dedicated servers, so be ready to dig deep into your pocket to get a slice of their services. The high prices notwithstanding, you’ll get a lot more resources than you would with any of the standard hosting providers in the market. Right now, they have four billing cycles; monthly, quarterly, semi-annually, and annual. You can conveniently manage your orders and payments via their Bill manager, a service control panel which reminds you of upcoming payments and generates reports as well. Don’t get stuck trying to configure or install an OS on your new machine. Call or send an email to their technical support team and they will provide you with satisfactory answers and timely assistance in every area of hosting. If you need advice or guidance on server configuration or server selection, they’ll be happy to guide you there, too. With data centers in Holland and Poland, MACHOSTER provides secure and reliable VPS and dedicated servers that can meet the resource demands of all of your traffic heavy websites or enterprise apps. Wondering how MACHOSTER stacks up against other Web Hosting companies? Enter any other Web Hosting company and we will give you a side-by-side comparison.